In assessing the first two full weeks of Donald Trump’s historic presidency, it certainly seems like the new Commander-in-Chief is taking fire from all sides. With conservatives serving as the lone exception to his boisterous critics, Trump’s willingness to flaunt tradition to fulfill a bevy of campaign promises has the Washington establishment in a tizzy. From Democrats in Congress to the mainstream media to liberals in the bureaucracy to the radical anarchist kooks out in Berkeley, by all appearances about half the country is having a collective seizure over the notion of a politician doing what he said he was going to do and daring to cross the threshold of contemporary political normalcy in declaring that laws will be enforced as intended. Matthew Continetti of National Review writes, “So unlikely did the election of Donald Trump seem to Washington and its denizens that the reality of it still has not sunk in. All of the city’s worst traits — the self-regard, the group think, the obsessions with trivia, the worship of credentials, the virtue signaling, the imperiousness, the ignorance of perspectives and people from outside major metropolitan centers and college towns — not only persist. They have been magnified with Trump’s arrival. For conservatives who have been waiting decades for a leader who will stand up and fight, it’s a great place to be in. Trump isn’t perfect and won’t be for as long as he occupies the Oval Office, but over the course of the campaign, the transition and his brief tenure in office the new president has shown that he isn’t the least bit intimidated by opposition, won’t go “wobbly” when the pressure is on and seems to be at his best when things are hottest. For the radical leftists who are out breaking store windows, burning limos, assaulting Trump supporters and stirring up fear in cities across the country, law enforcement and prison awaits as soon as Attorney General Jeff Sessions is confirmed. Rest assured, if local authorities won’t enforce the law, Sessions will. Trump promised as much during the campaign. The Democrats have done everything they possibly could thus far to prevent that inevitability, but it hasn’t – and won’t – work. “Many progressives want to see Democrats become part of the ‘resistance’ against Trump, obstructing and opposing him wherever possible. I’ve seen a number of references in the past month comparing the left’s recent reaction to Trump to the Tea Party rallies that sprang up in response to Obamacare in 2010. There’s no resemblance – at all. Tea Partiers embody the spirit of peaceful assembly and rally speakers hardly advocated violent overthrow of the government. 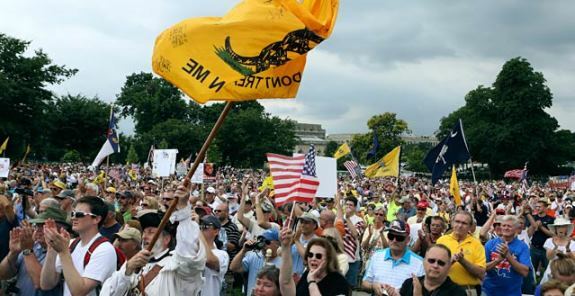 They came armed with American and Gadsden flags and many kept a copy of the Constitution in their pockets. They cleaned up after themselves and headed home from the gatherings to coordinate legitimate grassroots campaigns to win at the ballot box. In contrast, liberal speakers talk about blowing up the White House and their professional “protester” goons throw rocks at police, start fights at inaugural balls and smash through barricades. And even the so-called “peaceful” ones wear “pu—y” hats and make crude vulgar signs. For their part, wavering establishment Republican senators are experiencing some pressure as well, though from a different angle. Al Weaver and David M. Drucker of the Washington Examiner report, “Jeff Flake and Dean Heller are feeling the squeeze. “Both are Republican senators from out west who declined to support President Trump over Democrat Hillary Clinton. That is sure to test their relationship with Republican voters at home, possibly encouraging Trump loyalists bent on revenge to challenge them in their respective primaries. The practically hopeless political landscape for the left will likely only increase the desperation of the Democrats. The conservative and Republican grassroots will be just as motivated as ever to sustain majorities in Congress in 2018. With as many as ten vulnerable Senate Democrats in Trump-won states, there’s a very good chance the president will enjoy party majority backing for years to come. But it’s too early to talk about re-election or 2020. There’s plenty to be accomplished in the days ahead – and the “opposition” won’t help in any of it. Polls have never been able to accurately assess Trump’s popularity, why would they now? One of the more interesting aspects of the 2016 Republican primary campaign was observing the back-and-forth debate between pundits weighing-in on the validity of poll numbers. Survey after survey showed Donald Trump ahead in the GOP race – mostly by wide margins – but since Trump’s base of support was non-traditionally Republican many conservatives and party establishmentarians dismissed the findings as flawed and undoubtedly wrong. Then there were those who hypothesized Trump’s supporters were over-represented in polls and wouldn’t show up on primary day because they’d never bothered to vote before. The doubters were proven wrong in practically every instance all the way up to Election Day in November. While the national polls seemed to get the overall popular vote margin correct (Clinton +2) the individual state polls were off by enough to miss the “surprises” in Florida, North Carolina, Ohio, Pennsylvania, Michigan and Wisconsin, among others. Heck, Trump even came within a point of winning in Minnesota. If the pollsters were on their jobs, that fact should not have been overlooked. Now that the election is over and Trump is president, the debate over his “real” popularity percentages continues. Steven Shepard of Politico reports, “Traditional phone polls that use live interviewers — including some of the most trusted polls in politics and media — report limited support for Trump and the controversial executive orders he’s signed. But automated phone and Internet-based surveys tell a different story. Once the element of anonymity is added, the president’s approval ratings suddenly look a lot better. Judging by the figures in the Politico article (which cites and averages several polls) the difference between the surveying methods is plus or minus about five points, meaning online responses boost Trump’s popularity in a positive direction while phone calls take support away. I think there’s something to this “people are scared to talk to a live interviewer” theory though human nature helps explain the gap. The leftist protests and overtly harsh reactions of rabid liberals on social media have likely sent many Trump supporters underground. No doubt many people across the country watched in horror last week as a woman wearing a “Make America Great Again” hat was pepper sprayed in the face on live TV during the Berkeley riots. No one wants to be un-American. Mean-spirited we can live with. Debate will continue on Trump’s real level of support. I’m guessing it’s currently slightly higher than the average of the polls. If the president continues to keep his promises and the economy improves, the numbers will take care of themselves. The ink is barely dry on the papers officially nominating Judge Neil Gorsuch for the Supreme Court and already people are talking about President Donald Trump’s next appointment. Speculation is rampant that the Court’s “swing” vote, Justice Anthony Kennedy, is considering retiring this year. If that’s the case, assuming Gorsuch survives the arduous and desperate attempts by leftists and anarchists to stop him from being confirmed, Trump could have another decision to make on the Supreme Court early in his first term. John Fund of National Review writes, “Former Supreme Court clerks almost never speak for attribution when it comes to discussion of their former bosses, especially regarding their retirement plans. Nonetheless, a few have provided background information since Gorsuch’s name floated to the top of the Trump appointment list. It’s always fun to consider the unknown, isn’t it? Justice Ruth Bader Ginsburg has cancer and there have been rumors circulating around her looming exit from the Court for years but still she sits on the Supreme Court bench. Kennedy may be different, however, as the Gorsuch nomination could remove any reservations the Reagan appointee may have had in deciding to hang up the robe. Whenever the eventuality of Trump’s second appointment arrives, he’ll likely have support for it from the conservative base. Cristina Marcos of The Hill reports, “The last several days have brought a slew of victories for evangelicals, many of whom set aside their reservations about Trump to back him during the presidential campaign. It’s somewhat curious to witness how liberals remain surprised that conservative evangelicals continue to enthusiastically support Trump, but the explanation is simple: Conservatives vote for policies. Liberals vote for personalities and “temperament,” foolishly hoping a “good guy” like Obama will bring people together despite advancing policies that set groups against each other. Conservatives who supported Trump spent months pounding the policy over personality theme in the 2016 election. A vote for Trump meant, for example, a conservative Supreme Court replacement for Antonin Scalia. Check. It also meant support for religious freedom. Check. It also would likely result in conservative cabinet members. Check. The role of Vice President Mike Pence in this regard should not be undervalued. Pence is truly “one of us” in all respects and his constant presence at Trump’s side guarantees conservatives a real voice in the president’s decision-making process. It’s safe to say evangelicals won’t get everything they want from Trump, but no president would earn a perfect record with the way things are today in American politics. But the likelihood of getting another solid conservative Supreme Court Justice for Trump’s second appointment is very high. And that fact leaves conservatives satisfied, indeed.